A literal rhizome appears on plants. It is not a root, but more like a stem that sends out shoots and roots from its nodes. "Nodes" may make readers of this blog think of a network and that is one reason why the word was used to describe a kind of learning. As a gardener, I think of the plants (especially weeds and invasive species) that spread with vast networks of roots and will even shoot up new plants at a distance from the original. This method of spreading appealed to two French philosophers, Gilles Deleuze and Felix Guattari, in writing their book, A Thousand Plateaus. Rhizomatic learning is actually a variety of pedagogical practices that has more recently been identified as methodology for net-enabled education. This theory of learning is not like the goal-directed and hierarchical approaches that has been the traditional approaches in classrooms. In the rhizomatic approach, learning is most effective when it allows participants to react to evolving circumstances. That means the task or goal is fluid and continually evolving. That is a structure where the "community is the curriculum" and it turns teaching, learning and instructional design. Most educators and students are primed for pre-existing objectives. There is comfort in knowing where we are headed and then knowing that we have arrived there. Dave Cormier's introduction/preface/prologue for an upcoming edited book on rhizomatic learning is online as a long post. Cormier avoids a hard definition as he finds that when we define "particularly in writing, we necessarily exclude some of the nuance of the meaning. We leave out the chance that the definition can get better. We leave out another’s perspective." But people want definitions. It is no surprise that that Dave Cormier first came to worldwide educational attention as one of the early users and pioneering formulators of the Massive Open Online Course (MOOC). Those original MOOCs were often rhizomatic in structure in that the learning path, the goals and objectives of learners, and so the course it self, was not written in a stone syllabus. Cormier found in his teaching that using new technologies his students' work "became more diverse and more individualized, and, at the same time, I had lost some control over the teaching process." That can either feel exciting or frightening to a teacher. And yet, like most of us, Cormier's research reading indicated that "students were ‘most successful’ when they had a clear expectation of what success could look like." Having clear goals for each learning event did not match up with what he was seeing in his teaching. Curriculum that is textbook-driven (as far too much of our courses are "designed") support a highly structured, linear approach to learning. Add to that structure assignments that come from the content and answers to those assignments that are clearly stated (perhaps in the Teacher’s Copy) and you have a very un-rhizomatic growth pattern. This is growth restricted by borders, walls, planters and possibly even prevented from moving outside the structure by educational "chemicals" designed to kill off stray rhizomes, roots and shoots. It seems that what gave rise to the current rhizomatic learning growth spurt was the Internet. Cormier's piece goes back much further. First, he looks to Marcus Tullius Cicero and Gaius Julius Caesar. Then he jumps to the year 1270 and the University of Toulouse, and then to Switzerland in 1800. On that last stop in his history, Johann Heinrich Pestalozzi decides that in order to teach the entire country to read (this is before a public school programs and before teacher education programs) he needs standardization. His method is the textbook. It is a way to make 10000 identical copies of content that all will use. Pestalozzi was using the new technology of his time - the printing press. It allowed him to scale the learning process to more people. But his efforts and ones to follow not only sought to standardize the content, but also the process and the path to learning. Cormier argues that following that path may have led us to believe that simply following the path means that learning is occurring. He also believes now that under the technology, rhizomatic learning was always happening. As a simple example, he points at the citations in an academic article that thread back rhizomatically to sources. The Wikipedia entry of rhizomatic learning notes that educational researcher Terry Anderson has criticized the way in which advocates of rhizomatic learning seem to attack the idea of formal education as a whole. And one of Cormier's fellow MOOC pioneers, George Siemens, has questioned the usefulness of the rhizomatic metaphor: "I don’t see rhizomes as possessing a similar capacity (to networks) to generate insight into learning, innovation, and complexity... Rhizomes then, are effective for describing the structure and form of knowledge and learning...[h]owever, beyond the value of describing the form of curriculum as decentralized, adaptive, and organic, I’m unsure what rhizomes contribute to knowledge and learning." If this approach to learning is truly rhizomatic, it should be difficult to stop from spreading. Probably your first association with the word “curator” is a person at a museum. The word comes from Latin: cura, meaning “to take care.” The curator of a gallery, museum, library, or archive usually is in charge of an institution’s collections. Those collections are probably tangible objects like artwork or historic items. But the term “content curation” is a more recent variation. Content curation has become a term associated with the online world. Though some people might do this as a job, such as a social media manager, many of us do it for no pay. If you have a Twitter, LinkedIn, Pinterest, Facebook or other social account, you probably retweet and repost/share content. Curation means that someone has seen value in content and so is sharing it with friends and followers – and potentially with the entire online world. I think that everyone would agree that some people do this curation with more though and skill than others. A thoughtful curator gathers from a variety of sources, sometimes around a specific topic, and shares the best of what they find. For example, I might follow someone online because they post good information (original or shared) about poetry. A poor curator probably isn’t a curator at all. You probably have come across people who share silly things, inappropriate links and who may not even vet (make a careful and critical examination of) a link or article before they share it. You might unfriend or unfollow such or person. You might even take the time to try correcting them with a link to snopes.com or some other site that shows their information is incorrect. And here we get into that term that is so much in the air the past year or two – fake news. In all my years of teaching, I always had to teach lessons to students from 7th grade to graduate school about how to vet information in doing research. How do you know a source is valid? How do you know that a fact is a fact? Is your information up to date? Can you separate fact from opinion? I posit that all of us active online need to be good content curators. Just using this blog as an example, I try to be a good curator of the information I put into the online world. I try to follow good curation practices. I often write original content, but at least half of my content comes from other sources, such as books I am reading, websites, and podcasts. I try to share things that interest me but that I think will interest and help my audience. Who is “my audience”? After blogging in different places for 12 years, I have learned to look at my statistics and comments for where people come from (geographically) and what content they find most appealing. As when I taught research, I try to use trustworthy sources. I look for content that is relevant, timely, interesting, useful, and occasionally entertaining. A good curator gives credit to sources – give a link to the original inspiring article or the book or person. Give readers a way to get additional information if they want to go deeper into a topic. In the more commercial side of social media that concerns marketing (I do that too), there is the “social media rule of thirds.” This rule says that you should share a third on your original brand (which might be personal) content promotion, a third using curated content by others, and a third about the conversations happening on social media. You are reading this online, so there is a good chance you are a content curator yourself – whether you know you are or not. Are you a good curator? Leave a comment if you have any thoughts about this either on how others do it well or poorly, or about your own practices. When I first heard about a Personal Learning Network, I thought "Well, most of us already have a PLN." What I was thinking of was the informal network of people and sites that we use to do our work. Keyword: informal. I'm editing a dissertation about "Knowledge Broker Teachers" (KBTs). They are those teachers that other teachers go to for help because of their extensive knowledge. The subjects in the dissertation are technology KBTs, but in any type of knowledge work this tends to be more cross-disciplinary. A network that involves people with different skills working together is a good way to add novelty to problem solving. Not all PLNs are professional. People naturally create them around common interests or practices, to exchange ideas, and give or receive support to others. Blunden is interested in the professional variety. Her workshop explored "elements of your personal profile; build trust online; building reputation and credibility; curating learning and experiences; reflecting and sharing your work and projects; working out loud, and then also learning how to use social tools and media for the purposes of building trust, sharing your expertise and building a personal learning community." Back in 2007, I was noticing that people were talking about Facebook as a PLE (Personal Learning Environment) which was another term that emerged for me about the same time as PLN. Facebook did not become a true Personal Learning Environment though people seemed to think that after MySpace it might be such a thing. I was reading in the "Jargon Watch" section of Wired magazine and came across the term "Social Operating System" (SOS) which they defined as "a social network site like Facebook or MySpace that seamlessly integrates activities, including entertainment and shopping, to become a platform for online living." You can put the PLE and the PLN (and the SOS) under the heading Personalized Learning. 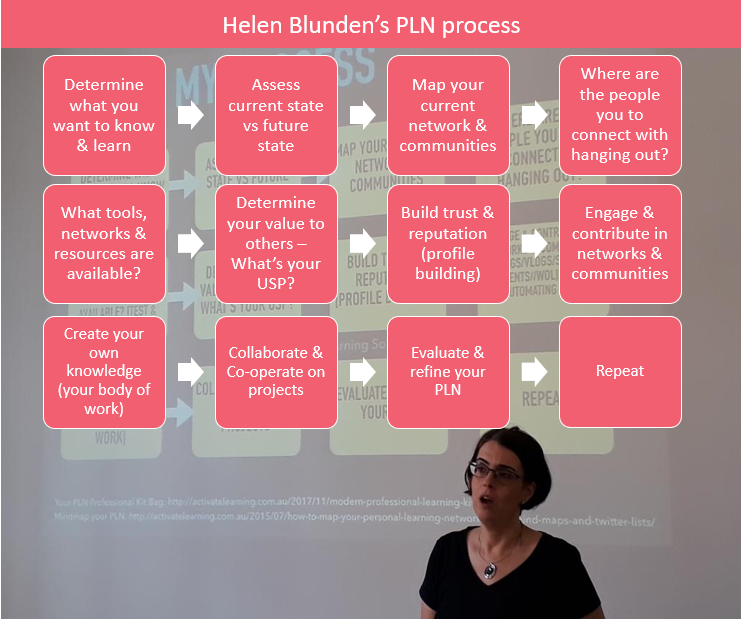 In 2013, I was changing jobs and started get more serious about trying to build a more formal network and wrote about creating your own PLN. I did that, but within a larger professional organization. Now, that PLN has formally disbanded because the larger organization decided to no longer support it after a reorganization. I still maintain many of the personal connections I made in that PLN, but it is again informal. How has the network changed for me? It is weaker. We meet - online and in person - a lot less than we used to connect. Formal is better.